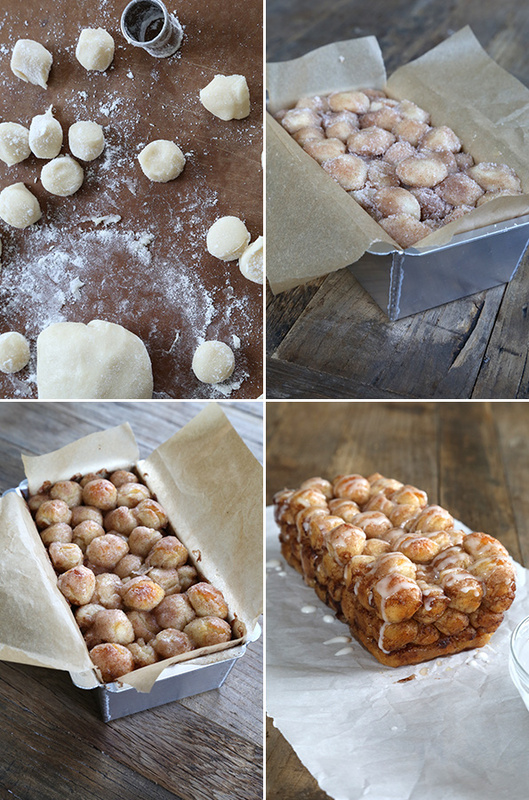 Super Easy Gluten Free Monkey Bread | Great gluten free recipes for every occasion. 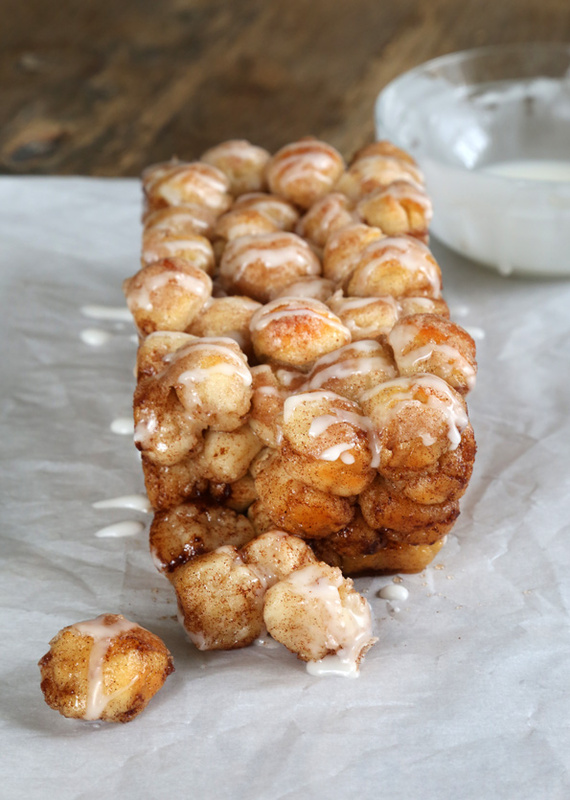 This recipe for gluten free monkey bread is easy to make, especially for the little hands of little kitchen helpers, and makes the house smell like warm, cinnamon goodness! Let’s start things off with a confession. This is not really a proper recipe for gluten free monkey bread. That recipe is on page 143 of GFOAS Bakes Bread. When my gluten free son (the inspiration for this site and everything that goes with it but don’t tell my other kids because all of a sudden they wish they had celiac disease) was in later infancy, he was terribly sick. It was awful. I try not to think about it too much (which is probably why I never really talk about it on the blog), and even 10 years later it’s hard for me to even look at any photos taken of him during that time, but it is what it is. He was a mess: no fat on his body, distended belly, sunken-in eyes, your basic parental nightmare. When we began a gluten free diet, he seemed to begin to improve overnight. It was nothing short of miraculous. But even once he regained weight and began to grow taller (finally! ), he needed years of physical and occupational therapies to regain muscle tone and strength and for his fine motor control skills to catch up. Back then, I used quite a different gluten free pizza dough recipe, and it was much stickier and more difficult to handle. And we rolled each piece of dough pretty tight, since we were working on Jonathan’s fine motor control. 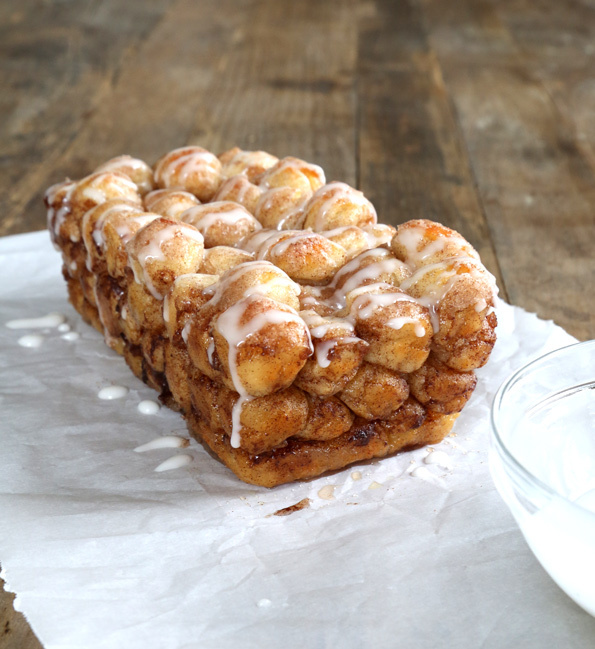 We did bake and eat that monkey bread and since it was rolled in cinnamon-sugar, I don’t remember anyone complaining too much. But it really wasn’t very good. Turns out that the last thing you want to do with pizza dough when you’re using it to make a super easy monkey bread is to roll it tight! So instead, here we just roll the pizza dough out, cut out rounds, and dredge them in butter, then cinnamon sugar before layering them in a loaf pan and baking it all. Tender and delicious, and perfect for my gluten free son, who’s now a healthy, athletic and smart almost-11-year-old boy. Oh, and my 2 girls love it, too. And their dad. Okay, and their mom. *Note: If you prefer, rather than allowing the dough its first rise for at least 12 hours in a sealed container in the refrigerator before working with it, you may make and use the pizza dough on the same day. It will not be as easy to handle, however, but you can work with it. To use the dough the same day it is made, after making the dough, set the covered dough to rise in a warm, draft-free environment to allow it to rise to double its size (about 1 hour). Once it has doubled, place it in the refrigerator for at least 15 minutes or until it is chilled. This will make it much easier to handle. Then, continue with the rest of the recipe instructions. Preheat your oven to 350°F. Line a standard 9-inch x 5-inch (or smaller) loaf pan with unbleached parchment paper, making sure that some of the paper extends over the edges of the pan. Set the pan aside. On a lightly floured surface, knead the risen and chilled pizza dough lightly until smoother as directed in These General Shaping Tips. Sprinkle the dough lightly with more flour, and pat or roll it out into a rectangle about 1-inch thick. Using a 3/4-inch round cookie cutter (or the open underside of a pastry tip of similar size), cut out rounds of dough, flouring the cutter as necessary to prevent sticking. Do not pack the dough or roll the pieces into a ball. Place the granulated sugar, cinnamon and salt in a deep, small bowl, and mix to combine well. Place each of the pieces of dough in the melted butter, remove with the tines of a fork to allow excess butter to drip off and place in the bowl of cinnamon sugar. With a fork or spoon, toss to coat and remove to the prepared loaf pan. Create a single, even layer of prepared balls of dough on the bottom of the loaf pan, and build up until you reach the top of the loaf pan. You may have some pizza dough left over, depending upon the size of your loaf pan. Press down gently on the dough in the pan and cover loosely with a piece of oiled plastic wrap. Allow the dough to rise slightly, just until it begins to swell (about 20 minutes). Remove the plastic wrap, and place the loaf pan on a baking sheet in case any of the cinnamon-sugar mixture leaks out of the loaf pan. Place in the center of the preheated oven and bake until lightly golden brown and the loaf springs back when pressed gently on top (about 25 minutes). Remove from the oven and allow to cool for at least 30 minutes in the pan. When the bread is nearly cool, make the glaze. In a small bowl, place the confectioners’ sugar and 1 tablespoon of milk. Mix well, until a thick paste forms. Add more milk by the 1/4-teaspoon, mixing to combine well, until the glaze falls off the spoon slowly, in a thick but pourable glaze. Add milk very slowly, as it is much easier to thin, than to thicken, the glaze. If you do thin the glaze too much, add more confectioners’ sugar a teaspoon at a time to thicken it. Lift the bread out of the loaf pan, peel back the parchment and drizzle the glaze generously over the top of the bread. Allow to set at room temperature. Adapted from the Cinnamon-Sugar Messy Bread on Spoonforkbacon.com. P.S. If you haven’t yet, I hope you’ll consider picking up a copy of Gluten Free on a Shoestring Bakes Bread! There’s a new cookbook coming out early next year, too! How did I not respond to this? 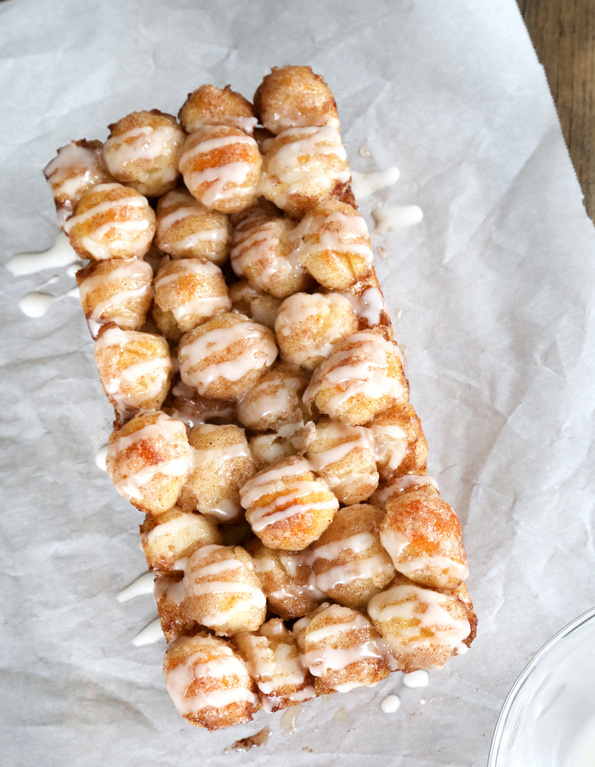 I love monkey bread and this will be a cinch! How long though in the oven?? I’m not so good with out a timer on! Sharon, that tapioca bread recipe is very, very different from others. In Gluten Free on a Shoestring Bakes Bread, I discuss how you can use a 5-speed handheld mixer with dough hook attachments to make my bread doughs, but you do need dough hooks. A food processor will not work, unfortunately! You’ve closed the comments section on the pizza dough recipe, so hopefully you will answer my question here. I don’t have a traditional stand mixer, but I do have a large Cuisinart food processor. Now, when I use to make traditional bread in it, and a recipe called to knead dough for 5 minutes, I could knead it knead to perfection in as little as 35-40 seconds. I was hoping you could tell me how to make your pizza dough and other GF breads in my Cuisinart food processor. I did find these rolls on this page: https://glutenfreeonashoestring.com/gluten-free-bread-recipe-against-the-grain/#disqus_thread However, that recipe only had one (kind) of flour and I didn’t know if this would make any difference or not with the density or not. Anyway, I don’t have a lot of money or counter space (if it’s not necessary) to get a stand mixer, as I already have a Bosch Universal Bread Mixer, it’s just it’s too big to make a small amount of pizza dough or just 1-2 GF loaves. Thanks, I’ve enjoyed your blog thus far. Has anyone ever tried making the pizza dough with less salt? My mom eats it with me even though she isn’t GF, but she is coming home from the hospital this weekend on a very strict low-sodium diet. Any way to reduce it would certainly help (that goes for any of the other bread recipes too!). We have really enjoyed every recipe we’ve tried, both from the blog and GFOASBB. This looks delicious! I’m so sorry to hear about your son, but I’m glad you were able to figure it out and get him on the right track. Thanks you for sharing this story. Heartbreaking, but so wonderful that he is on track now. And thank goodness for an awesome doctor not taken in by dimples! Boys with dimples are absolute trouble! No one wishes for a disease for their child, but I try to remind myself that at least the one my child has is treated with diet alone. No needles, insulin, surgeries, or chemo; and for her, no OT needed. It’s sounds like Jonathan has recovered very well, he has one smart mommy! Amanda’s health has improved so much as well, each day we hear from family and friends how well she looks and how much she has grown. She was diagnosed 2 years ago and the improvement is miraculous. You make it so easy to make healthy food with your recipes and she never feels left out because we have wonderful resources here. Thank you Nicole! We love you! Looks like heaven in a pile!